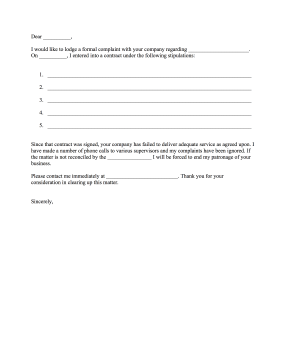 This complaint letter for bad service lists numbered stipulations under a contract's rules that can be filled in by the client. Since that contract was signed, your company has failed to deliver adequate service as agreed upon. I have made a number of phone calls to various supervisors and my complaints have been ignored. If the matter is not reconciled by the ________________ I will be forced to end my patronage of your business. Please contact me immediately at __________________________. Thank you for your consideration in clearing up this matter.